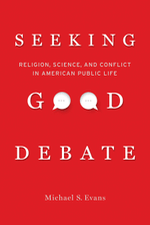 Seeking Good Debate: Religion, Science, and Conflict in American Public Life examines the results from the first-ever study to combine large-scale empirical analysis of some of our foremost religion and science debates with in-depth research into what Americans actually want in the public sphere. Seeking Good Debate is available now! Check out the official book website for reviews, teaching guides, media coverage and more. Or order right now at the UC Press website and get 30% off with code 16M4197.